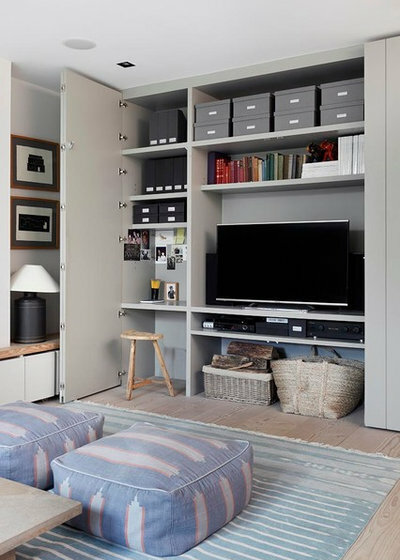 It’s easy to create a lot of storage space in a sizable home, but a good designer will also be able to fit smart storage into small, irregular spaces while challenging the traditional way of thinking about what “storage” is. 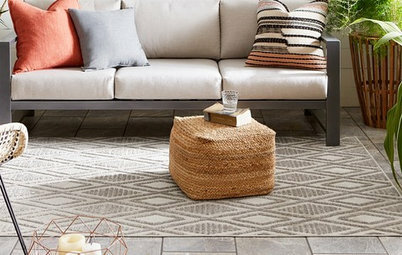 Use these ideas as a jumping-off point for your own projects to squeeze every last inch out of potential storage areas. 1. 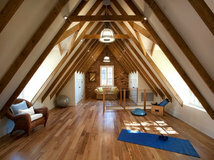 Maximize every inch in an attic conversion. 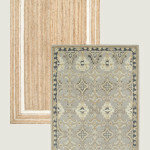 The built-in seen here is perfect for a guest room. 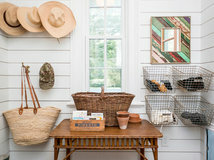 The great thing with an attic space like this is that the slanted ceiling creates room for cabinet storage, especially for bulky items you don’t use often, such as suitcases. 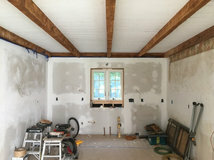 In this room, not only have the sloped sections been fitted with drawers and doors, but the cabinetmaker has also made a cozy, cabin-style sleeping nook. 2. Use dead space in the bathroom. This ingenious idea for bathroom storage makes use of that often-empty space behind the bathtub. A storage unit like this one is something you may have room for in an existing bathroom, unless your bath butts up to a wall at the faucet end. If you’re installing a new bathroom, consider how you might make use of this area and position your bath — or choose the size of the tub — accordingly. 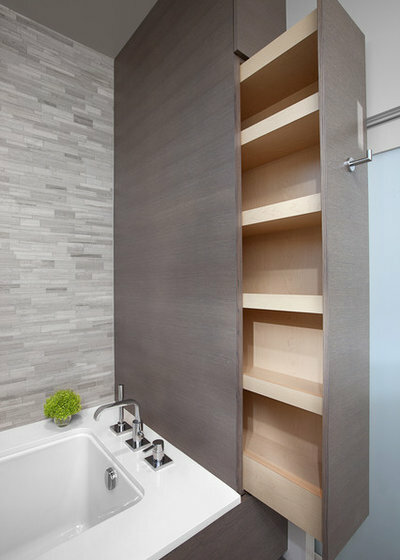 This smart custom solution provides front-accessible shelves that simply slide out of sight when not in use (and a handy towel hook to boot). 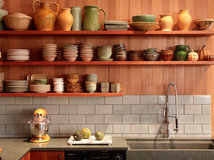 Before your cabinetmaker builds the shelves, consider what you’ll store on them to ensure that they have enough height. If you’re trying to give the impression of a bigger bathroom, you could paint the cabinets the same shade as the walls, or consider tiling the area if your tile shape and size permit. 3. 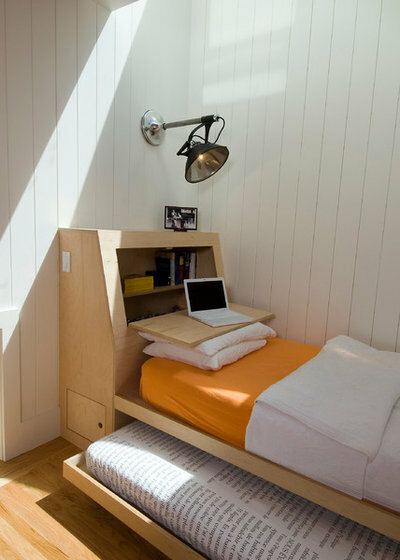 Build in storage-smart bunk beds. 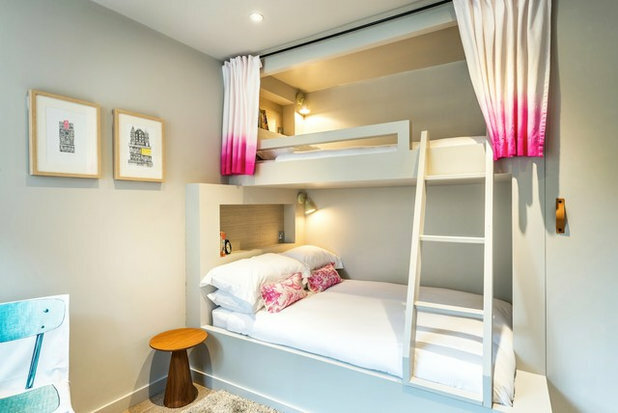 If you’re short on space, why not take only half of it by building in bunk beds? This may work better for kids than adults, but it can still be fun and grown-up, and you can create clever extra shelving within the structure too, set into the wall behind the pillows, as here. A woodworker should also be able to incorporate a couple of roomy drawers beneath the bottom bunk to make even more use of the space. 4. Fit drawers into the side of your staircase. One space-saving trick is to use the area under a staircase — including the steps themselves — as storage. 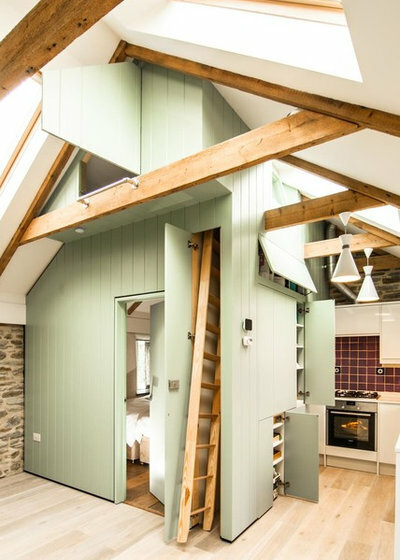 This might not work in a traditional interior, or if you already have storage under the stairs, but if you’re building in a new staircase, or steps between levels in an open-plan space, consider this savvy idea. 5. Contemplate pullout steps. 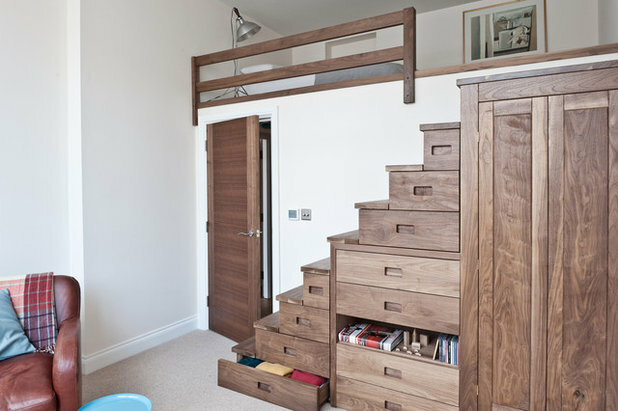 What about if the steps themselves actually become drawers? 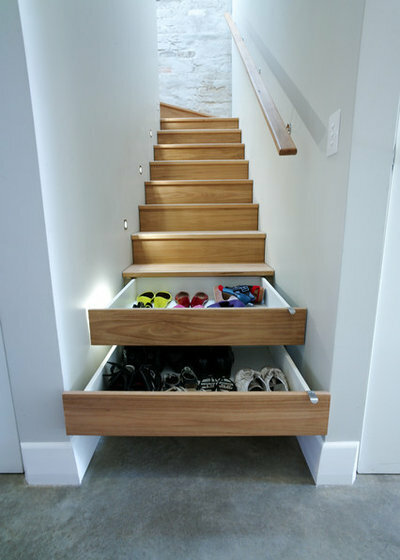 You may not want all of them to be like this, but a few close to the bottom of the staircase could be useful for shoes, as shown here. Amending existing stairs wouldn’t be difficult for a skilled woodworker: You could simply have your first three steps removed and refitted with a drawer system. 6. Fashion a shelf desk. 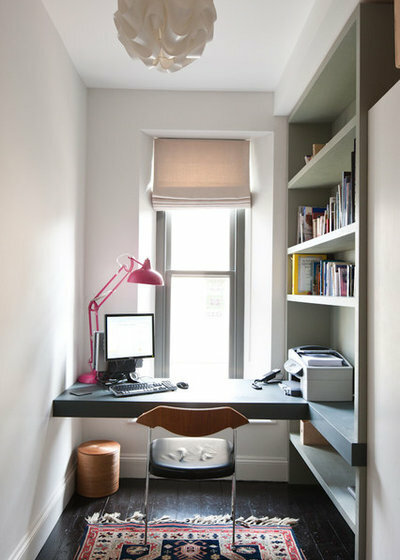 If you work from home but have only a small room, or portion of a room, for your home office, consider this is clever but simple design idea. A built-in shelf desk is light and doesn’t take up much space at all. 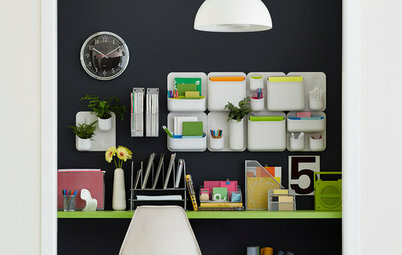 In this case, the desk-shelf is chunky, so the wall attachments are concealed. 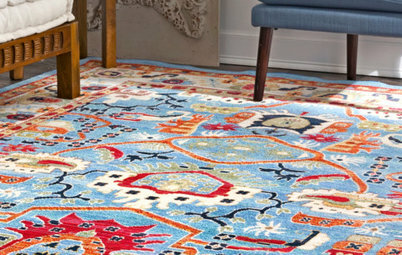 These eliminate the need for legs, allowing the maximum floor space underneath. It’s a good idea to consult a builder about the correct and safe supports for a shelf like this, as it will need to carry the load of a computer and maybe a printer and other office equipment. 7. Hide your office in a cabinet. If you don’t have space for a stand-alone desk, this is another option. 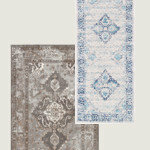 You can pull out the chair, do the work and, when you’re done, just close the doors to have a tidy room again. 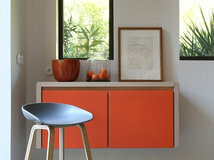 If you have the space to have your cabinetry built almost to the full width of the wall or room in question, you won’t even notice it when the door is closed — especially if you paint it the same color as the walls. 8. Carve up your cabinets. Create cabinets that have a rich inner life by carefully thinking about what you’ll use the storage for during the planning stage of your project. 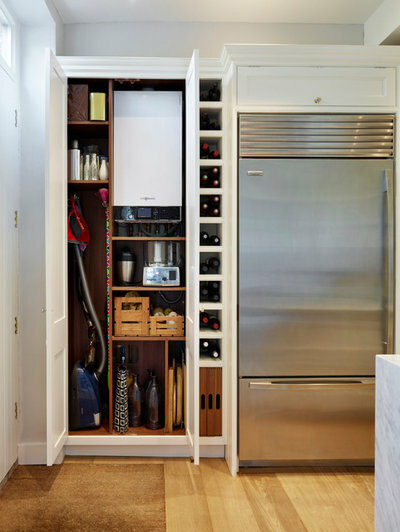 Your cabinetmaker can help you to create a thoughtfully compartmentalized space for all those items that are better hidden away — vacuum cleaner, ironing board, cleaning products and boiler included. 9. 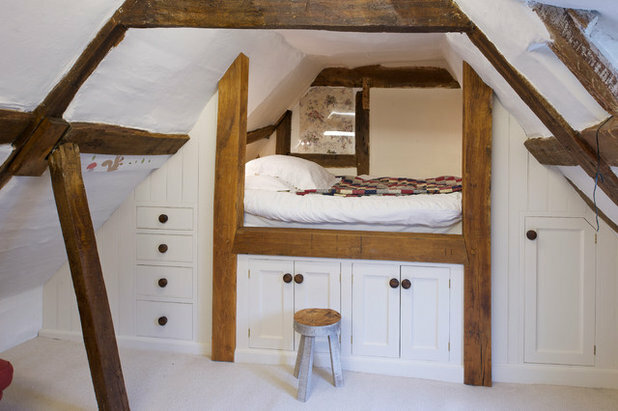 Create a full-height storage solution in your attic. 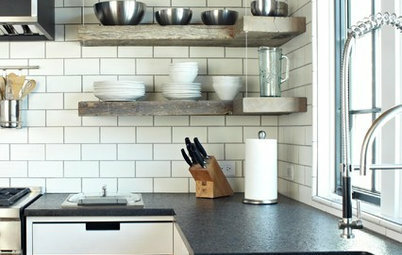 Whether with shelves or cabinets, it makes sense to build right into the eaves or go floor to ceiling in an attic. As already mentioned, attics are a treasure trove for creating storage — there are so many locations that require only a bit of imagination and a good woodworker. The key consideration in this clever pod-style bedroom, with its high cabinet spaces, is safe access. If a storage area is higher than your ladder, you may need to consider stairs as an option to reach it. 10. Make a multitasking bed. 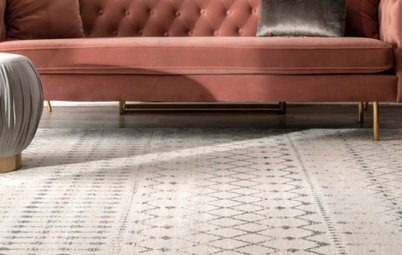 If you’re very short on space, try transforming a bed into something more. 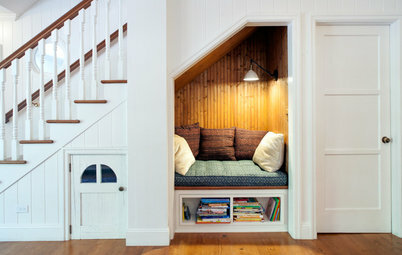 This sleep spot also incorporates a desk, storage space and a spare bed. It’s a great solution for a teenager’s bedroom. When planning, be sure to allow space for the length of the bed plus additional space for the desk and storage area, and consider where you’ll mount electrical sockets for lamps and recharging laptops and phones. 11. Add spacious underseat storage. 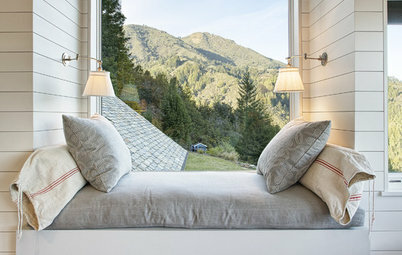 Bay windows look beautiful, but they can sometimes be awkward to put to practical use in terms of storage. 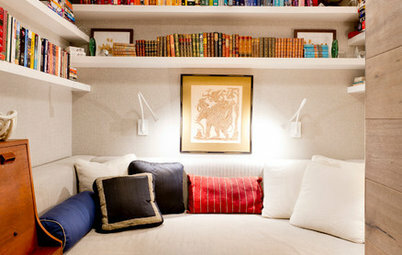 Transforming them into comfortable seating, with space for your favorite books just below, as seen here, is a good option. 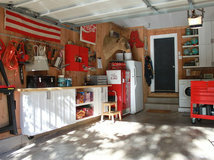 I like the open storage, rather than doors, as it makes this woodwork appear visually lighter. Note how the cabinetmaker has added floorboards around the base to help the unit meld into the architecture of the existing room. 12. Commandeer the shed. If you’ve used every inch in your home and still need storage, you could consider installing a custom garden shed — one designed to accommodate the storage you require, and configured to hold much more than just gardening paraphernalia. 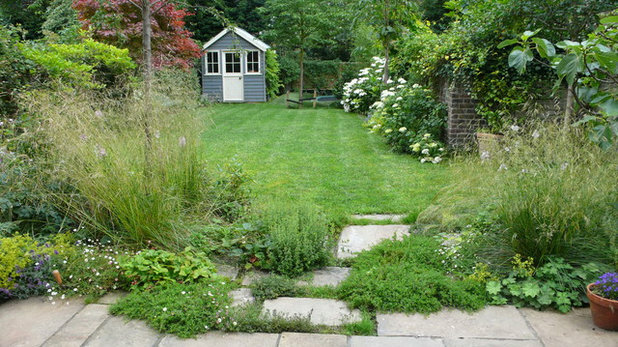 Of course, if you have the space and budget, an outbuilding at the bottom of your garden could even give you an extra bedroom or bathroom. 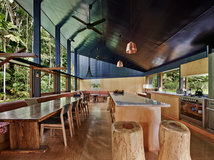 If you’re thinking along these lines, you’ll probably need planning permission — think of it as a mini-house. 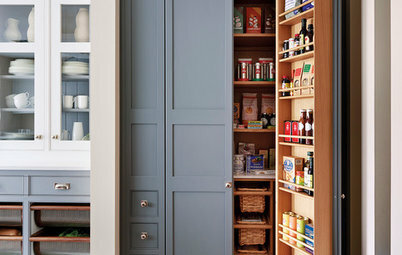 Tell us: How have you built extra storage into your home? Share your ideas and images in the Comments below. 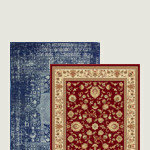 Marianieman, I found that the heavy weight Mexican blankets I ordered for my yoga students were a perfect weight and size for the bunks in my grandkids' room. 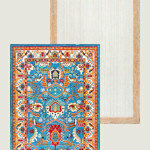 Multiple color combinations available, and easy care....just an idea for you.